First off, if you didn’t have a chance to read the first tip I highly recommend that you do. Yesterday we discussed providing content for free and how perceived value and tangibility can significantly improve your subscriber rates. Today we are going to talk about another strategy that is guaranteed to boost your opt-in rates! To continue the List Eruption launch week, we are going to talk about something that ALL big Internet Marketers do to help build their list. It is “The Power of Story Telling”. This means that they use stories to help paint a picture in the visitors head of how they were able to solve a specific pain in their life or business. Telling a story is similar to a case study, however usually it is more personal. One of the best story tellers in our niche, Ryan Deiss, does an excellent job of telling stories. By the end, he has you hooked to the point that you will basically do whatever he wants you to do at the end of his video. People pay him thousands of dollars JUST do deliver a story that ties into their product/service. So you are probably wondering why telling stories work so well at building your list. First, it shows that you are human. By telling a story that actually happened to you and how it impacted your life, you are showing your personality and that you are human. Second, people will connect with you. They may have a similar story or struggle with the same problems you have. If you show how the product you are offering solved your problem, they are MUCH more likely to buy or sign-up because they will feel it can do the same for them. Third: A story makes your product or service seem more exciting. Just like a climax in a movie, you want to build hype and excitement through your story. Like we discussed the first list building tip, try offering a piece of content in the form of a story. Typically a video will be much more engaging, especially for telling a story, so I highly recommend using video for this. Tell your story and let people know if they download or buy whatever it is you are giving away, that they will be able to fix the problems you had. Make sure if you haven’t already, to sign-up for the List Eruption launch so you get emailed a direct link to the special offer on launch day. 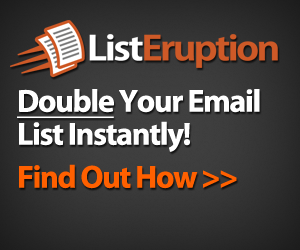 List Eruption Launches w/ Special 7 Day Discount!